This surgical steel belly bar has a 925 silver split gecko design and is available in a 6mm, 8mm, 10mm or 12mm size. 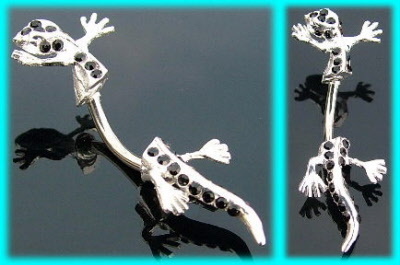 The sterling silver lizard design is split into two parts, with the head replacing the usual screw on ball, and the surgical steel shaft, which goes through the piercing, making up the tail end of the gecko. The overall design measures 36mm x 15mm and is set with black crystals. These belly bars, which are available in four different shaft lengths also come with clear, dark green, light blue and pink stones. Powered by ShopFactory to sell P9090 online. All-in one eCommerce and online shopping cart software.